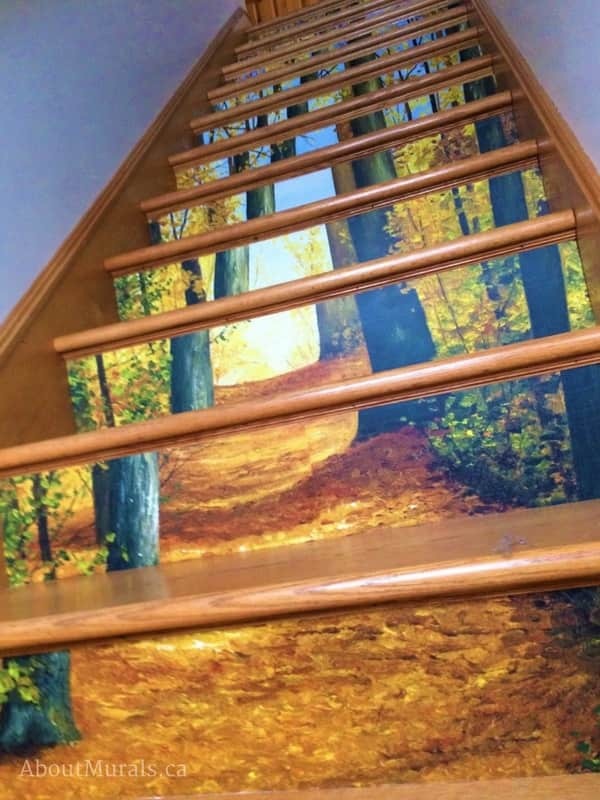 Do you love the look of this stair riser wallpaper but not sure if it’s really for you? I’ve spent hours getting in touch with customers who’ve used my Path of Light wallpaper on their stair risers so that you can see photos of it in real life…and read honest feedback from them about the project. Are the colours right for my space? Is it durable enough for my stairs? Is this look really on trend? I know it can be difficult to see the pattern of this stair riser wallpaper once it’s been all cut up, so I thought I’d share my (totally BORING) stock photo so you can see it in more detail. Keep scrolling down for all the exciting photos of it in action in customer’s homes! 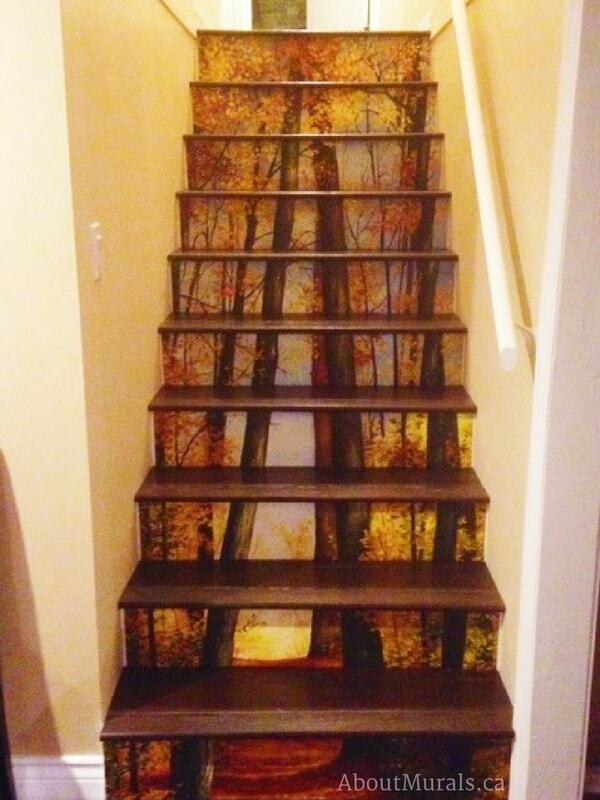 The stair riser wallpaper that’s been viewed 952,576 times on Pinterest! So here’s a pin of my Path of Light stair riser wallpaper that’s been viewed over 952,576 times on Pinterest! 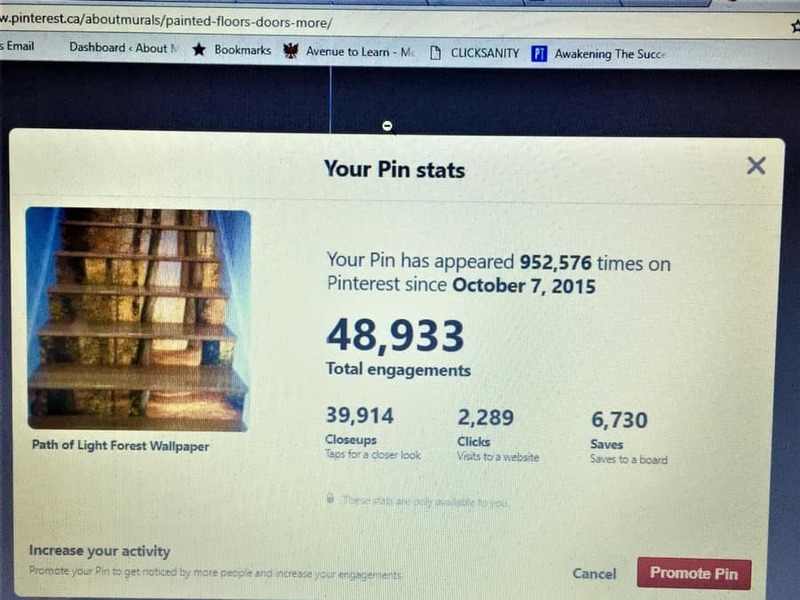 I’m serious…check out the snapshot of my Pinterest account below! The autumn forest wallpaper is mostly orange – don’t you think it pops out against the blue walls? Since every stair riser has a different width and height, this wallpaper comes in one size (4’6″W x 8’0″H) that can be cut to custom fit your stairs. It comes in three 18″ panels, so it’s really easy to handle. They pre-measure and cut the wallpaper to fit each riser, starting from the top step and moving down. They watch my how-to video, explaining how you would hang wallpaper on walls, but use the same process for their stairs (prepping the risers, dipping the wallpaper into warm water and applying it right to the riser). I did have one customer who bought wooden planks, cut the wallpaper and installed it onto the planks, and then glued that to the risers. She did this because the original stair risers weren’t in good condition. Shop all my Forest Wallpaper designs! Although this stair riser wallpaper is super durable (aka it won’t peel off or rip), it is removable. I made a how-to video explaining how my wallpaper is removed, and the same process can be used for your stairs. 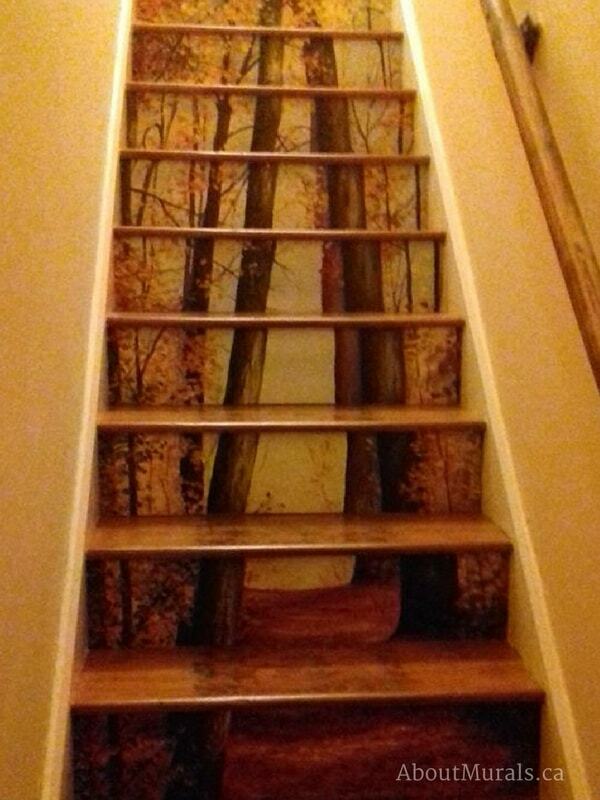 Don’t believe me that a removable wallpaper can be durable on stairs? Keep scrolling down to read what my customers have to say! This autumn forest wallpaper is created from an original painting and the colours are amazing! Lots of orange and blue – but I know it can be hard to tell from your screen. If this is an issue for you, you can always order wallpaper samples. Is it durable enough for my stairs? Ask my customers! My customers can speak to this better than I ever could. Here are some snapshots of emails from my customers talking about how durable Path of Light has been for them. 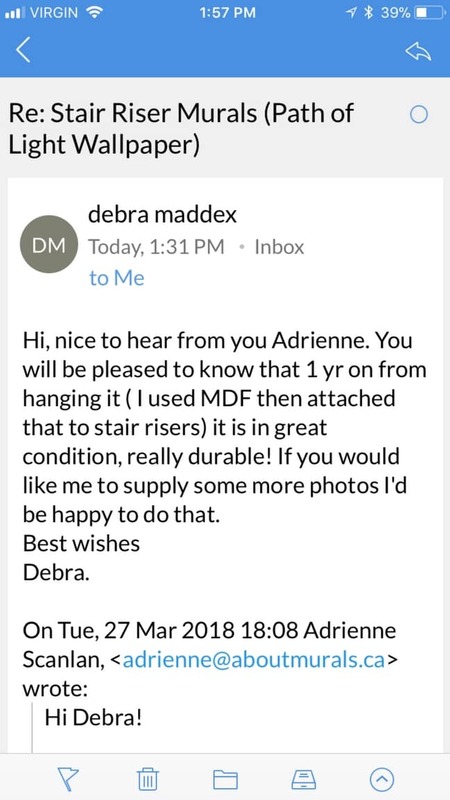 The first is from Debra who installed her stair riser wallpaper in March 2017 (a year ago as of this blog post). 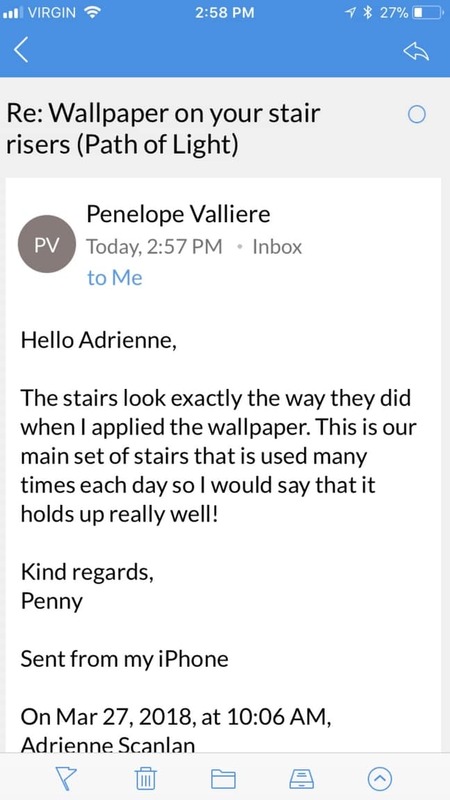 And this email is from Penny who installed the stair riser wallpaper in September 2016 (a year and a half before this blog post). If you sign up to my newsletter, I’ll send you my latest wallpaper sales, more inspirational customer photos and some DIY tips and tricks.